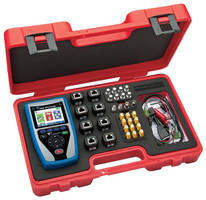 Multifunctional Cable Tester incorporates full-color display. 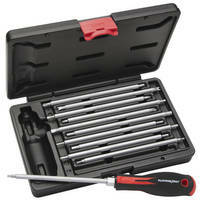 Multi-Bit Screwdriver Kit ensures right tool is always available. 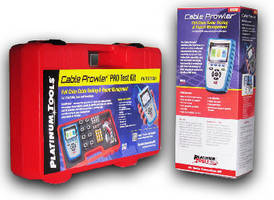 Cable Test Kit measures length and identifies link status. 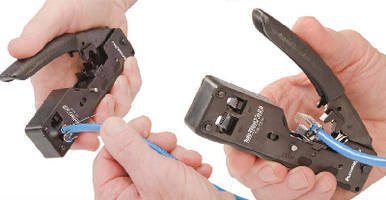 Cable Termination Tool exceeds 10-Gig performance standard. Self-Adjusting Wire Stripper features built-in cutter. Made from high grade polymers and carbon steels, Maxim 6 features stripping range of 24–10 AWG and cutting range of 30–10 AWG. Autoform laminated stripping jaws form around radius of cable to prevent damage to inner conductor, while built-in wire stop measures strip length. Suitable for round, oval, and flat wire cable, tool has ergonomic handle designed to minimize fatigue. Ergonomic Crimping Tool offers smooth ratcheted crimp cycle. Multii-Bit Screwdrivers combine ergonomics and versatility. Compact Cable Cutter combines ergonomics and capacity. Cable Test Kit tests and reports in full color. Terminal Crimping Tool combines durability and versatility.